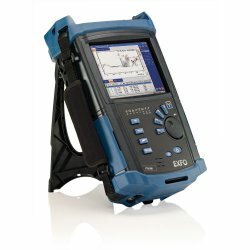 The Exfo FTB-200 is a intelligent modular platform that is designed for ethernet, optical and multiservice test and measurement. This quality, compact device is capable of accommodating two field-interchangeable modules and integrates various hardware options including a visual fault locator, power meter, and fiber inspection probe. Exfo FTB-200 is specially designed to increase the technician’s productivity during testing exercises. It has a Four-second power-up time, allows quick for acquisition and processing of data during measurements, and features super fast reporting capabilities. In addition, the FTB-200 is a robust testing solution for large-scale network deployments. As a supertech platform, it excels and offers a solution for triple-wavelength insertion loss testing and data integrity testing. It capably offers testing speed, power, and modularity in one compact, smart designed package. The platform includes a touchscreen that is resistant to dust, water, shock, and common chemicals. It has dial and shortkeys that allow simple selection and scrolling, and the extended battery capacity makes it ideal for many testing applications including OTDR testing, FTTx, and metro/access networks. The design of FTB-200 makes it an excellent solution in all stages of network lifecycle. It can perform numerous applications in the construction and installation of a network. It is also suitable for system provisioning, services action, and various applications in the maintenance and troubleshooting of networks. This platform allows instantaneous AutoSync USB-based data transfer, and is also designed to enhance acquisition of data during testing exercises. It supports virtual applications and remote control and offers flexible connectivity to a variety of devices. Some of the standards that are supported include USB A/A-B, Bluetooth and RJ-45. It will also allow software upgrades and file transfer through USB. The Exfo FTB-200 is well known for its durability, and is capable of withstanding harsh environments in the field during testing exercises. It superior design and functionality will allow technicians to use it virtually anywhere. Quality design features include sealed joints, a waterproof outer shell, and door panels. These features offer extra port protection making it suitable for use even in a moist and dusty environment. Exfo FTB-200 also offers an advanced TFT display that will enhance the readability of measurements even under direct sunlight. The included FTB-200 software has been designed to enhance OTDR testing efficiency for both singlemode and multimode applications. This feature makes the device an ideal platform for test applications involving long-haul and LAN networks. Users will have an instant access to a wide variety of OTDR traces. This capability allows for access traces from various test equipment manufacturers. The technician is able to view all results at once and enjoy unmatched OTDR post-analysis. In addition, the software lessens the time required when retrieving the OTDR traces. For testing exercises that require flexible trace analysis, FTB-200 software allows echo management and measurement and changing of fiber attenuation. Contact Test Equipment Connection for a quote or for more information. This entry was posted in Site News and tagged Exfo FTB-200. Bookmark the permalink.